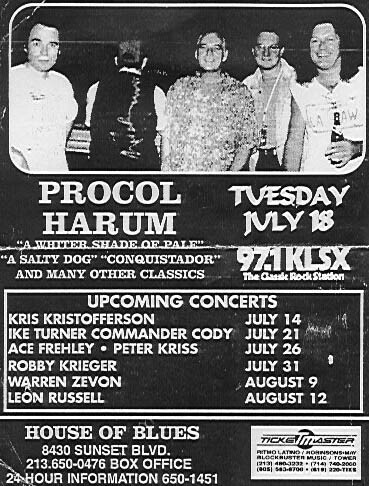 It cost $20 to see Procol Harum; the previous week the Kinks had played three nights at $37.50 a ticket. Robbie Krieger was $12.50 in the same month, Nitzer Ebb $20, Toots & the Maytals $17.50, Jefferson Starship $22.50, and the Ike Turner Revue + Commander Cody were $15. Alpha is reputed to be the first-ever Brooker / Reid song. You could tell that some genuine affection had developed for Matt Pegg. Matt was effusive in his praise for GB as a person and bandleader. Total dedication! Plus, the twenties set really related to him, opening up a whole new dedicated PH audience. Fool's Gold was a power house, especially the interplay with Graham and GB on the solo. Has that BJ military style, and truly on the same page as GB. Matthew had so much charisma working at both shows, in a zen fashion; unaware of it, but the crowds were in awe of his mastery. Whitehorn's combination of power and finesse was an eye-opener for the uninitiated. Better yet, I liked the way he insisted on buying me a brew after the show. As to GB, as a people-watcher, the reaction of the masses generally was: I can't believe it. His voice is stronger and better than ever. OR as to his piano, what is the sound of a jaw dropping? You could tell that many of these people had never been or experienced anything like it. I am sure they made many new fans on the tour. I told Gary I thought he had the band to take him into the new millennium, and he seemed to be thinking, you know, you might be right!